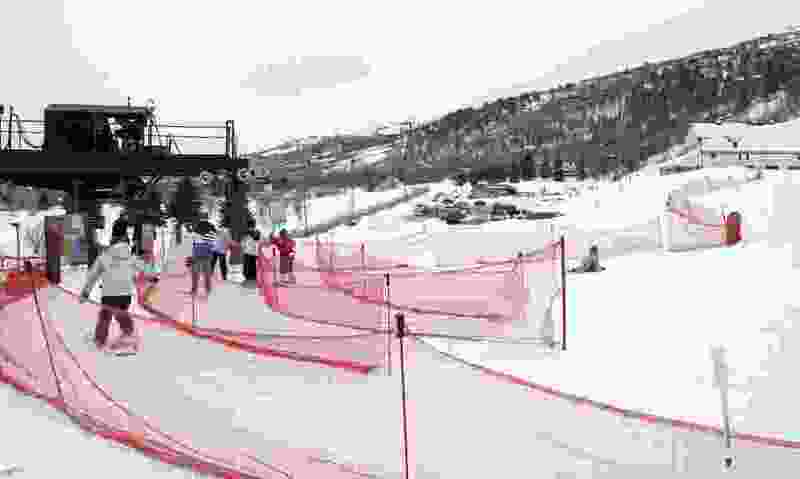 (Danny Chan La | The Salt Lake Tribune) This 2001 file photo shows Troll and Viking lifts at Nordic Valley carrying skiers up the slopes above Eden in Ogden Valley. The 140-acre ski area, known as a place for beginning skiers, could see a major expansion into the Uinta-Wasatch-Cache National Forest under a proposal by its new operator, Colorado-based Mountain Capital Partners. Utah’s tiny Nordic Valley ski area would see a major expansion into unroaded national forest turf under a plan recently unveiled by the ski corporation that assumed management of the 140-acre resort in the picturesque Ogden Valley. The proposal’s most dramatic element is a 4.3-mile gondola rising over Wasatch Crest, at an elevation of 8,100 feet, connecting North Ogden to Eden. It would be among the world’s longest gondolas, exceeding the 3.8-mile Grindelwald–Männlichen ski gondola in the Swiss Alps, and would likely be a lightning rod for controversy among those who want to see the Wasatch’s undeveloped terrain stay that way. But such a lift would make great ski terrain accessible from a Wasatch Front city via a 20-minute gondola ride, inviting more people to participate in skiing and snowboarding, as well as summer alpine activities, according to James Coleman, CEO of Mountain Capital Partners. He promises a “responsible and inclusive” project. “You are not going to clear-cut the mountain of trees. We have a lot of experience with this,” said Coleman, whose firm operates five smallish resorts in the region surrounding its Durango, Colo., headquarters. Mountain Capital Partners wants to expand into 2,800 acres of Uinta-Wasatch-Cache National Forest west of Nordic Valley, although it has submitted no formal proposals to the U.S. Forest Service or Weber County. To gather community feedback, the firm held an open house in Eden on Thursday and plans another for Aug. 14 in North Ogden. Utah has not seen a ski area expansion of this magnitude since major additions at Snowbasin and The Canyons during the run-up to the 2002 Winter Olympics. The Nordic Valley expansion would cover a narrow, undeveloped stretch of the Wasatch Mountains bound by Ogden and North Ogden canyons. A key sticking point would be getting Forest Service approval for such a major shift in use for public lands, especially territory that is inventoried as roadless and has previously been proposed for wilderness designation. Much of the land within the proposed expansion is subject to the 2001 Roadless Area Conservation Rule, which limits activities that require the building of permanent roads and prioritizes protection of roadless values. Although inventoried as roadless, the expansion area is categorized as land where road building could be allowed, according to national forest maps. Coleman envisions installing about a dozen lifts on both the east and west sides of the mountain, adding one a year, although the actual pace of development would depend on market forces. He wants to build the gondola first, starting as early as 2020 for use that ski season later that year. “That would be such a marquee feature that puts us on the map. It provides such a multiple level of benefits to the community. You can get from one side of the mountain to the other without driving through the canyon,” said Coleman, who got his start in business as a 6-year-old selling rocks in his Austin, Texas, neighborhoods. He joined the ski industry 19 years ago when he bought New Mexico’s Sipapu resort. Currently, Nordic Valley is Utah’s smallest and cheapest ski area, equipped with three lifts, or four if you count the “magic carpet" conveyor for kids, with a vertical drop of just under 1,000 feet. An adult season pass can be purchased for $499. Day passes are $45, less than half the fare charged at Utah’s big ski areas. Its Apollo lift tops out at 6,330 feet. Because of low elevation, Nordic Valley is typically the last Utah ski area to open for the season and the first to close. “Nordic Valley, as it exists, is not profitable. I’m not sure it would survive if we didn’t come in and improve it. That said, affordability is really important to us,” Coleman said.